Can You Cram for Altitude? Study tests different elevations to prepare for racing in thin air. One tactic to mitigate the effects of altitude is to arrive early to give your body a chance to adjust to the lower oxygen levels. 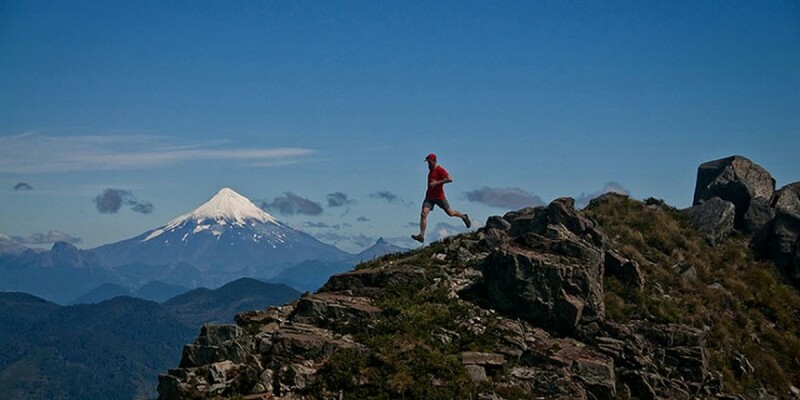 Studies have found that performance steadily improves for about 14 days after arriving at a higher altitude. But not everyone has 14 days to spare before a race. Can you accelerate this process by going to an even higher altitude—e.g., heading to 10,000 feet for a few days before a race at 5,000 feet? That’s what a new study in the Journal of Applied Physiology, from Ben Levine at the University of Texas Southwestern Medical Center and colleagues at several other institutions, investigates. The study design was pretty cool (and sounds like a great way to spend a summer). A group of 48 college runners gathered in Dallas for four weeks of supervised sea-level training to get everyone on the same page. There, they did some baseline testing including 3,000-meter time trials on the track. Then they flew to Salt Lake City and split into four groups, living at various elevations—Heber City (1,780 m), Park City (2,085 m), Deer Valley (2,454 m), Guardsman’s Pass (2,800 m)—in the Wasatch Mountains for the next 28 days. All the athletes gathered daily to do their training together, with hard workouts at lower elevation. That helps to control for the “training camp effect,” in which athletes who head to altitude get better simply because they train harder and have fewer distractions than usual. 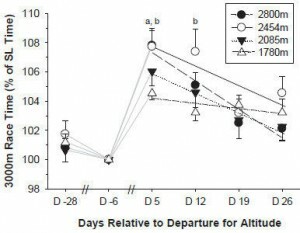 Graph of adaptation to altitude. It’s pretty clear that the higher the subjects were living, the slower they were initially. That’s not totally unexpected, because altitude triggers both positive and negative adaptations, and it’s difficult to know in advance how they’ll balance out. As time went on, all the groups began to accumulate adaptations to altitude and improve their performance at 1,780 meters. You might even argue (though it’s far from clear) that the highest altitude produced the best performance by the end of the camp. For practical purposes, though, the overall conclusion is that if you’re racing at 1,780 meters—just a little higher than the elevation for the Bolder Boulder 10K—you’ll likely benefit if you can spend at least five days at that elevation before the race (with diminishing returns thereafter). But you’ll be worse off if you spend your pre-race time at higher than 1,780 meters, unless you can stay there for at least 19 days. The timelines are approximate, of course, but the message is that higher isn’t necessarily better.